Anyone buy from DR Gun Supply? Looking at picking up a Leupold scope and they have great prices, but the site looks a bit sketchy and was wondering if they are legit or not? Re: Anyone buy from DR Gun Supply? On the other hand, SWFA has a deal right now, $10 off $100, $20 off $200, $30 off $300 until Monday I believe. I purchased a couple of guns from them a while back and had some issues with the FFL paperwork. However to their credit they did handle it in a timely manner and everything was resolved. However it was super sketchy and the paperwork stuff resulted in a pissed off FFL dealer and a delay in my firearms pickup. If it’s a super good deal I might consider it but I avoided them with my last firearm purchase and decided to pay $20 more somewhere else in order to avoid the hassle. Keep in mind the scope will not be coming from DR gun supply but some other business. That was my only experience and it wasn’t terrible but wasn’t great either. Which scope you looking at? Dont know anyone that is a veteran or LEO? Pretty big discounts. There are a few other random sites in the high $700s and then most are $900 or more. Thats a really good price. $679 is what I was shown. Got the scope last night. DR Gun drop ships them from a wholesaler and the transaction went smooth. which reticle did you go with? I am trying to decide. The duplex looks a little thick from what I can see on their website. Thought about doing the TMOA but that looks a little busy. Wish they still offered the windplex. I went with the boring old duplex. It's mounted and I'll have my first chance to shoot it tomorrow. In the garage, it looked pretty thin but we'll see. I do like the construction and fit & feel. Eye relief is more than I expected and it's nice to have a compact, light scope back on the rifle. Boring is good sometimes. Did you look at their website and compare to what you got as far as how thick the reticle looks online. Might be one of those not to scale things. I'll try to take a cell phone pic, but between the forecast tomorrow and my skills, don't hold your breath. It is much lighter than this one in person. Yeah that is the one I was looking at and thought it was too much. Good to know. Might just go with that one and save another 150 over the TMOA. 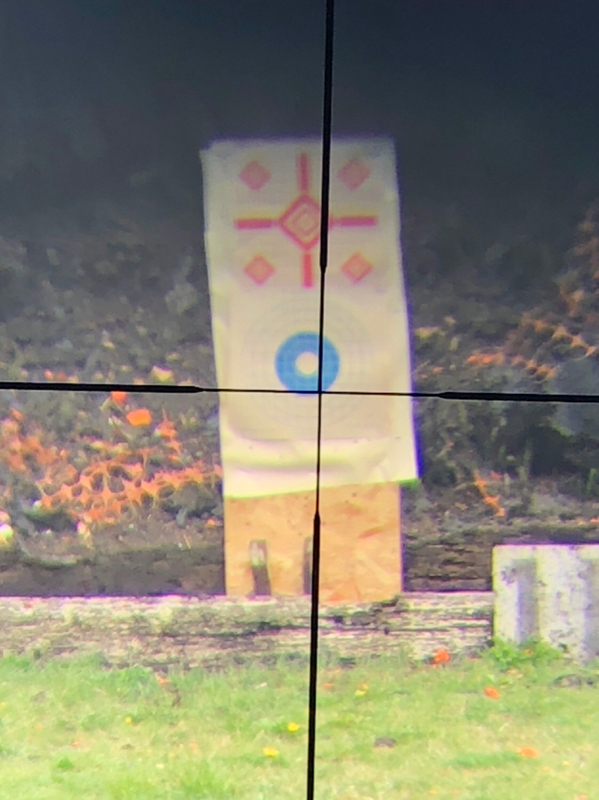 Here is a lame pic, 100 yard target at 15x. It was much clearer in person, the phone was not cooperating. Thanks that will work just fine. Not nearly as thick as the online duplex pic. Page created in 0.135 seconds with 44 queries.